Rabett Run: Ice Ages and Delayed Feedbacks - Shakun et al. Eli is posting a translation of an article by Jörg Zimmermann (one of the G&T six), about the implications of Shakun et al, and how by clarifying much about the feedbacks that bring the world out of the ice age it shakes a core tenant of climate change denial. The implications, although Jörg backs away a bit at the end in an overly scientific display of humility, are world shattering. What you write a lot about speaks to what you are concerned about. When Vahrenholt and Lüning's concoction "The cold sun" appeared the extensive PR campaign made it clear to me that it was a boring repetition of old denier myths. [Eli recommends Rob van Dorland and Bart Verheggen analysis and reply on V&L] When Bild, Focus and the Spiegel danced in rhythm to the denialists melody, then you are compelled to respond. 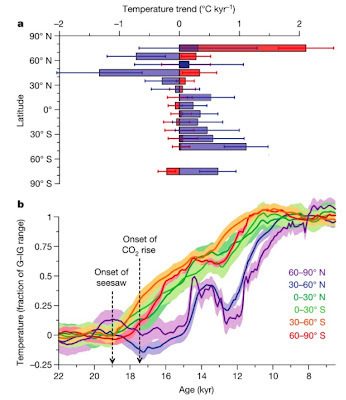 An article by Jeremy Shakun, Clark, He, Marcott, Mix, Liu, Otto-Bliesner, Schmittner and Bard, Global Warming preceded by increasing carbon dioxide concentrations during the last deglaciation, Nature 484, 49-54 ( 2012) is quite a different case. The article was not accompanied by major media attention, but the content removes a leg supporting a particular myth, and thus, lead to violent reactions among those who exploit this myth. That they have so vigorously tried to explain away the results of this recent scientific study reveals how close to the bone they feel it hit. I'm certainly not the right person to evaluate paleoclimate work. Fortunately, George Hoffman has done this on his blog, and he is definitely an expert in this field. And of course there are also posts at Skeptical Science, Real Climate and good comments from the readers. The work of Shakun et al. 2012 nicely illustrates how complex the processes are that take place during the strong climate changes following the end of an ice age. The so-called Milankovich cycles lead to relatively minor changes in the annual amount of solar radiation that reaches the surface and its distribution over climatic zones that can only cause major changes in the global climate through feedback effects. Calculation shows the need for the feedback effects to reach the magnitude of changes in the earth's energy budget needed to explain the difference in global temperature between glacial and interglacial periods. It is ignorant to pretend that changes in the solar insolation alone cause the ice ages. It is believed that shorter winters can result in increased thawing of snow and ice at high latitudes, thereby exposing surfaces that less efficiently reflect the sun's rays into space. The Earth then enters a phase in which a little more energy from the sun remains and gently heats the ground. This is the first feedback loop: the thawing of ice and snow reduces the albedo of the earth, its ability to reflect radiation. The more the earth warms, the more ice and snow melts, lowering further the albedo of the ground, and increasingly heating it. That sounds like a feedback loop that increasingly accelerates, but it is limited by the fact that a much hotter earth radiates more into space and thus a new equilibrium is always established. What shifts this equilibrium further, is the greenhouse effect because if the earth warms, for various reasons, the mixing ratio of carbon dioxide in the atmosphere increases. This is the second feedback effect. Why the mixing ratio of carbon dioxide rises when global temperature rises is only partially clear. Although the ability the oceans to dissolve carbon dioxide the oceans decreases with increasing temperature you can calculate how much CO2 will outgas from the oceans, and this is only a fraction of the measured change in the carbon dioxide mixing ratio. Global warming leads to a further increase in carbon dioxide emissions into the atmosphere, and we would like to understand the mechanism. Another feedback effect is that a warmer atmosphere can hold more water and therefore increases the humidity. Since water is a greenhouse gas itself, an increased absolute humidity leads to further warming, which in turn increases the absolute humidity. Here, too, there is no "runaway" global warming. The increased radiation from the earth into space will bring the energy budget of Earth at some point into balance. This radiation increases with the fourth power of temperature due to the Stefan-Boltzmann law, which provides a reliable upper bound on the temperature. Therefore, changes in global temperature the greater part of which are caused by feedbacks, are by themselves evidence that a significant climate forcing exists. How do you discover the cause for the increase in carbon dioxide during a global warming? First, it helps to track changes in the isotopic ratio of carbon dioxide in the atmosphere. In plants, the heavier isotope 13 C is depleted, and if the productivity of vegetation decreases there will be more carbon dioxide in the atmosphere. We see this as a decrease in the proportion of the total 13C-carbon in the atmosphere. The sinking of organic matter from the upper oceans to the seabed can form a reservoir for carbon with low levels of 13C. With appropriate experience, you can put together the changes in isotopic distribution in these carbon reservoirs and increases in atmospheric CO2 levels and figure out that the degassing of dissolved carbon dioxide on the surface plays only a minor role. Secondly, you need really good data on the distribution and timing of temperature increases on the Earth in relation to the increase of the CO2 mixing ratio, because then you can calculate the effect of outgassing of CO2 from the oceans reasonably well. For this it helps to have a model for the carbon cycle which includes biological productivity, But there are still more complications. It is not enough to know the radiation budget in climate zones, how the albedo changes regionally, and how much greenhouse gas is in the atmosphere. Heat transport in the ocean currents also impacts the climate. The best known is probably the effect of the Gulf Stream and the North Atlantic Current on the heat balance of Europe. Practically speaking the Gulf Stream is a heat pump from the tropical Atlantic in the Americas to the cold North Atlantic waters of Europe and the Arctic. Without this heat pump winters in Europe would be longer and colder, snowier and the albedo of the region would be increased throughout the year. The result would be not only regional cooling. This heat pump is not trivially simple. [Ice is pure water (except for captured concentrated brine). The presence of the Arctic ice pack means that water in the Arctic ocean has a higher salt content]. It is driven by the fact that high salinity and cold water sinks into the bottom levels of the Arctic ocean and flows south. Melting too much ice in the Arctic decreases the salinity of the water in the upper ocean, which is then not dense enough to sink, and interrupts the circulation of water between the Arctic and the tropics. These large-scale ocean currents shoveling the accumulated solar energy from the tropics to the poles where the earth sheds heat to space and significantly reduces the temperature differences between the climate zones. 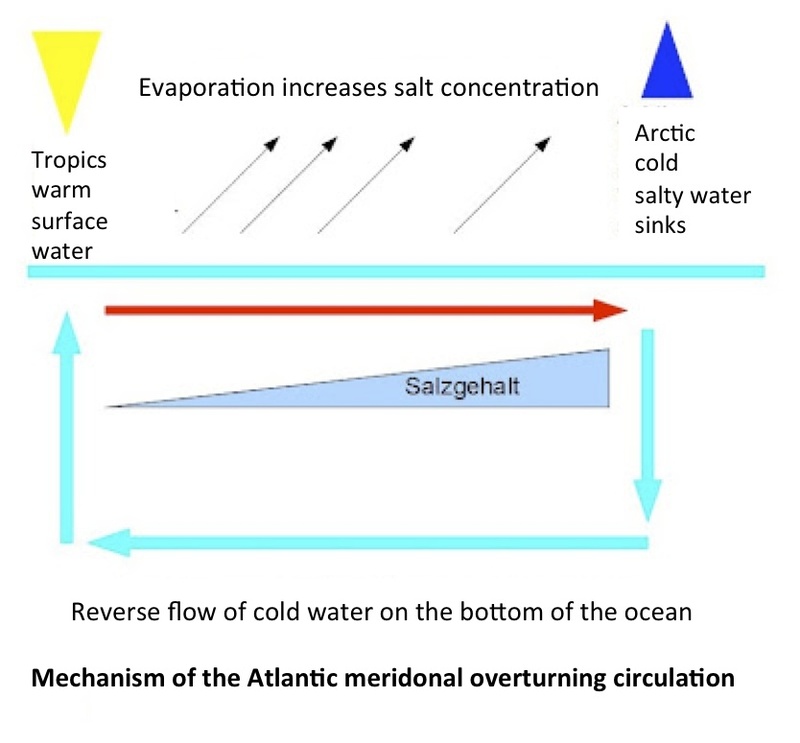 The name of the ocean current that transports water in the Atlantic Ocean between the Arctic and tropics, is the Atlantic meridional overturning circulation and has the English abbreviation AMOC. With the Milankovich cycles, the albedo feedback, the CO2 feedback, the humidity feedback and the variation of the AMOC, we have a set of five components that together can help to explain why small global changes in solar insolation during Milankovich cycles cause glacial and interglacials periods with global temperature differences ranging from 3 to 6 degrees. Shakun et al. find that at the end of the last ice age temperature increased immediately in the Arctic but only slightly, probably as a result of increased radiation during the northern hemisphere summer. As a result a small portion of the Arctic ice melted. The melt water had a lower salt concentration and thus was less dense than the surface water and sank although mostly not to great depths. The result was that the AMOC and thus the associated redistribution of heat between the Arctic and the tropics was interrupted. This meant that the temperature in the high northern latitudes no longer rose, but may, in fact, have even decreased slightly. This is exactly what was found in the data. As a result, the temperature rose in the southern tropics and then the southern temperate latitudes and finally in Antarctica. Only then did the data show an increase in CO2. So somehow warming of the southern latitudes leads to increased emissions of CO2. Simultaneous determination of the isotopic ratio (for example, according to RF Anderson, S. Ali, LI Bradtmiller, SHH Nielsen, MQ Fleisher, BE Anderson, and LH Burckle, Wind-Driven Upwelling in the Southern Ocean and the Deglacial Rise in Atmospheric CO2, Science, 323 , 1443-1448 (2009).) suggests that the CO2 source is a consequence of biological fixation of carbon residues, for example in plankton deposited on the ocean floor. This increase in CO2 concentration is more than twice as strong as expected from outgassing of CO2 from warmer sea water alone. It indicates that the exchange with the Southern Ocean deep water became more intense and carbon deposits were transferred from the depths to the surface. Only after a significant temperature increase in the south and an increase in CO2 concentration, did the temperature rise again in the northern hemisphere. This is interpreted as providing a feedback mechanism for for greenhouse gases to drive global warming. The temperature data shows that after temperatures initially rise in the north they drop again. Apparently, the collapse of the AMOC, cuts off the flow of heat to the north from warm tropical sea water. The compilation of regional resolved temperature time series makes it possible to divide such processes into single steps. It is critical to exactly date each temperature time series because without this the correct order of different temperature gradients at various latitudes will be lost. The data show that depending on the location of the temperature data there is a preceding or following change in the CO2 data. Viewed in context, this is just the greenhouse effect of CO2 and the associate feedback from increases in the absolute humidity during warming. The greenhouse effect of the additional water in the atmosphere, causes rapid changes in temperature of several degrees in a few thousand years. And what does this mean for today? It may mean that we must expect that global warming has a significant delay, perhaps hundreds of years, maybe more, which could lead to massive global changes - a change in ocean currents with rapid redistribution of global temperatures and an increase of natural CO2 sources that occur, even if man-made CO2 emissions have been long since cut back again and we actually expect that the CO2 mixing ratio would decrease again. Global warming does not stop immediately when manmade emissions of greenhouse gases disappear but has centuries-long repercussions. However, many questions remain open about the mechanism that leads to the natural CO2 emissions operate. Therefore it remains speculation as to whether additional natural CO2 and methane sources would be activated by man-made warming. Well, that would seem to be the end of the Holocene. Soylent Green and scavenging it will be. 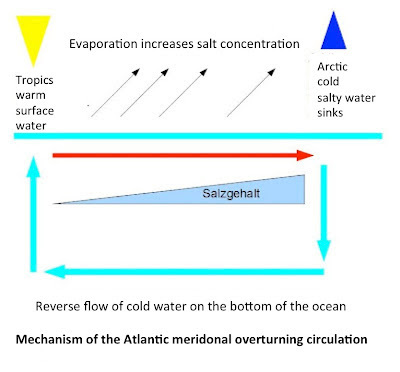 Stopping the overturning circulation means cutting the access to the other water cooler on earth (Arctic) so it logically follows that if the rate of cool water formation around Antarctic doesn't increase, the southern hemisphere will warm. And the Antarctic didn't lose much ice during the previous big thaw. How it'll do this next time remains to be seen. Humanity is committed to committing the planet to FUBAR. The tenants are ready for rent control. I wish I lived in North Carolina where they have laws against such scary stuff. Is he kidding when he says, "Therefore it remains speculation as to whether additional natural CO2 and methane sources would be activated by man-made warming."? Looking at the last AGU conference in SF, and it is clear that there is a lot of "free" CH4 separated from the biosphere only by a relatively fragile layer of permafrost. Some of this permafrost is under the ESS,where it has been kept in good condition by the cold brine rejected during sea ice formation. As there is less sea ice formation, what is to keep the fresh water ice under the sea floor in good condition? Well nothing really. And, we see CH4 on Barrow, AK hourly monitor at 2,500 ppbv. To me, this looks like a methane burp in the ESS as seen by sparse air monitoring equipment 400 miles away. It is not like this is a surprise; we have been seeing reports of increasing methane releases in the Arctic for years. Any climate model that does not include carbon feed backs is not useful for planning, public policy, or engineering decisions. The only worth while speculation is how fast Carbon Feedbacks will unfold. It's increasingly clear that carbon cycle feedbacks are going to carry on warming the planet long after human come to their senses . . . presuming we eventually do. * We are probably going to see +4C eventually. * We need to adapt (designing new infrastructure, preparing for crop failures, moving stuff back from the coasts) for those impacts. * At the same time we need intensive mitigation; radical emission cuts to try and make a +4C world a matter of CENTURIES of medium-speed feedbacks and not DECADES of civilization-suicide. * Bleak as this is, it gets bleaker: we need to study geoengineering options for the possibility that we have set in motion changes that we can't adapt to. > although mostly not to great depths. Something missing from that there; can you expand it a bit? I hate to bring this subject up again but space based irradiance solutions are looking better and better all the time here. Artificial weather will be better than no weather at all at this point. Hank, I agree there's a problem with that sentence about melt water. I guessed that the melt water density was controlled by both salinity and temperature, and therefore it sank until it found an equilibrium that was less deep than it would have been if it were saltier. It should be made clearer what's going on there. It's an interesting and scary article.